One of the things that you check up on regularly is the recent activity of your online accounts. While that works only on services that provide you with the information, it may help you spot irregularities fast. Companies such as Google, Yahoo or Dropbox have been displaying activity information to their users, while Microsoft has not done so until recently. While Microsoft did make available online accounts to users for a long time, it switched only recently from various account systems to a unified Microsoft Account scheme. And with it came the recent activity feature which displays recent account activity to users. Load the Account summary page on the Live.com website. It displays your name and account aliases among other information. Note that you need to sign-in to the account if you are not logged in already. Switch to recent activity, you find it listed on the left sidebar. The last activities of the account in chronological order. For each activity, its type, date, time and location is displayed. When you expand the selection, you will also see the IP address, platform, and browser / app that was recorded. In addition, the location is shown on a map as well. Successful sign-in - A successful account sign in. Security challenge - An unusual sign-in was detected, and as a consequence, an extra security challenge was displayed (e.g. from a new device or after clearing cookies). Incorrect password entered - The wrong password was entered. "data" added or deleted - This highlights that information, such as phone numbers, alternate email addresses or recovery codes, were added or deleted. All security info marked for removal - All security related information, such as phone numbers or authenticator apps, were scheduled for deletion. Account name changed - The identification name was changed. Password changed or reset - The main account password was changed or successfully reset. Alias added or Alias deleted - A new account alias was added, or an existing alias deleted. Primary alias changed - The main alias for the account changed. Two-step verification turned on or off - The additional sign-in security layer was enabled or disabled. App password created or deleted - An app password was created or removed. Profile info changed - Information such as the gender, name, birth date or postal code was modified. 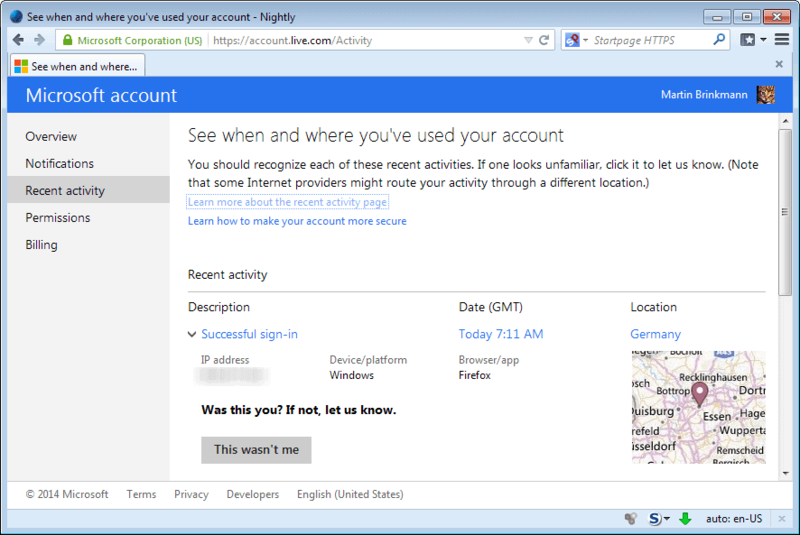 Account created - A Microsoft account was created. If you see account activity that you are certain was not by you, you may click on "This wasn't me". If you do, you are walked through several steps designed to make sure that your account is protected against third-party access. This includes changing the account password and verifying that all security information are correct.